More than 50 Mt. 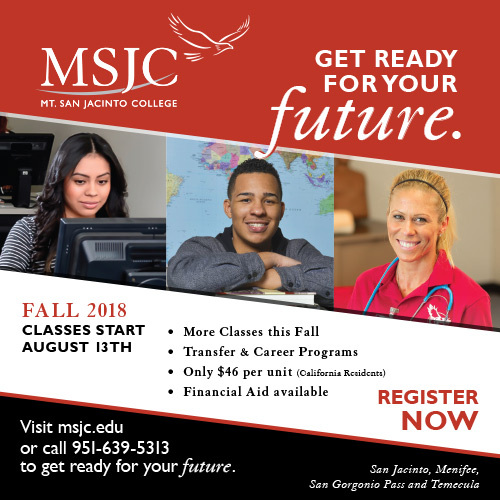 San Jacinto College students received nearly $90,000 in scholarship funds during the MSJC Foundation’s annual Scholarship Reception. The May 9 event was held at Wilson Creek Winery in Temecula. Rene’ Michelle Floyd, a Perris resident, won first place in the SOCO Business Competition – a competition for MSJC students modeled after the TV show “Shark Tank.” She received $5,000. The SOCO Group awarded a total of $20,000 to four students. Photo caption: The Mt. San Jacinto College Foundation awarded 54 students with scholarships totaling nearly $90,000 during a luncheon on May 9, 2018.